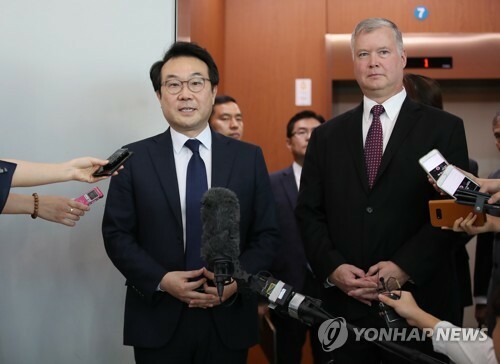 WASHINGTON, Oct. 25 (Yonhap) — U.S. Special Representative for North Korea Stephen Biegun will travel to South Korea next week to coordinate steps for the full dismantlement of North Korea’s nuclear weapons program, the U.S. State Department said Thursday. Biegun will visit Seoul Monday and Tuesday to meet with his South Korean counterparts on “diplomatic efforts to achieve the final, fully verified denuclearization of North Korea as committed to by Chairman Kim in Singapore,” the department said in a statement. Biegun was appointed in August to lead negotiations on the implementation of an agreement reached by U.S. President Donald Trump and North Korean leader Kim Jong-un at their historic Singapore summit in June. Kim committed to work toward “complete” denuclearization of the Korean Peninsula in exchange for security guarantees from the U.S.
U.S. Secretary of State Mike Pompeo traveled with Biegun to Pyongyang earlier this month and came away with an agreement to launch working-level talks between the special representative and his North Korean counterpart on the details of the deal as well as a potential second summit between Trump and Kim. Those talks have yet to begin. Biegun’s South Korean counterpart, Lee Do-hoon, was in Washington earlier this week for consultations on the matter. Lee later told reporters that they also talked about a possible road map for North Korea’s denuclearization and reciprocal steps from the U.S., and how they can rally the support of the international community to that end. Lee and Biegun have met 11 times. Pompeo has said he hopes to meet with his North Korean counterpart next week.